It is with deep sorrow that Aleto Construction Group announces the passing of our founder, owner and company patriarch, Thomas F. Aleto. Tom passed peacefully on December 3rd, 2018 after a long illness. Tom began Aleto Construction in 1955, bringing with him a lifetime of passion for building beautiful and well-constructed projects. The son of Italian immigrants, Tom began his building career at 19, managing new construction crews for C.F. Vatterott Construction, St. Louis’ oldest building firm. Over the course of his 60-year career, Tom developed an amazing set of talents – building, drafting, carpentry, bookkeeping, communication and (as anyone who met him will attest), exceptional people skills. He could be fairly described as a one-man company, the passionate go-getter who learned it all, so he could do it all. But the truth is that Aleto Construction was never a one-man company, but a team of professionals who shared Tom’s driving passion for building exceptionally well. Tom’s greatest legacy is the company he created and the children he raised with the same fearless attitude toward life. Tom and his wife, Kay, had seven children, three of whom followed their father into the construction business. Tom always credited Kay for his success – as the great love of his life, she inspired and supported him for the many years it took for him to achieve their dreams and raise their family. Today, Aleto Construction operates under the direction of his daughter Patti and son Mike. Tom will be dearly missed not only by his family, but also by friends, clients and everyone on the Aleto team. While demanding, he was always generous with his support and time as he mentored young carpenters over the years, and when some of them learned enough to strike out on their own as independent entrepreneurs, Tom was not disappointed to lose them; rather, he took great pride in helping others achieve their fullest potential, no matter where it took them – a true testament to the exceptional builder’s spirit. Tom earned many honors and held many key roles over his long career as he worked tirelessly to establish remodeling as a respected profession in the St. Louis area. He was a founding member of the Remodeling Guild of Greater St. Louis, which later became the local chapter of the National Association of the Remodeling Industry. He also was a founding member of the Remodeler’s Council of the Home Builders Association of St. Louis. 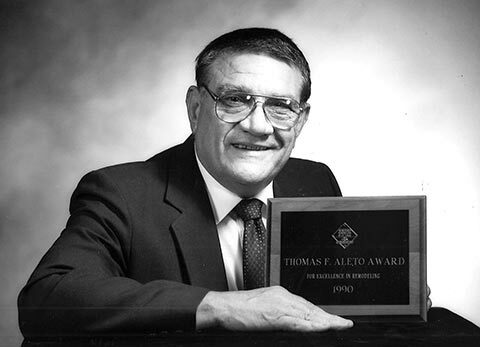 The Thomas F. Aleto Award for Excellence, presented by the Registered Remodelers Council of the Home Builders Association for outstanding work in contracting, was named in Tom’s honor in 1990, reflecting the depth of respect he inspired among his colleagues in the business. In the end, Thomas F. Aleto was a caring man in a tough business, and his legacy can still be found in every Aleto Construction project. By raising renovation to an art form, conducting business with equal parts passion and compassion and passing his love of building on to his family, team and countless others, Tom’s passing marks one sad day within a long continuum of a life celebrated for integrity and love. Services: Visitation Sunday, December 9, 4-8 p.m at Kutis Funeral Home South County; 5255 Lemay Ferry Rd. Funeral Monday December 10, 9:30 a.m. from Kutis Chapel to Assumption Church for 10 a.m. Mass. Internment Sts. Peter & Paul Cemetery. In lieu of flowers, contributions to The Alzheimer’s Association appreciated. The entire Aleto family and Aleto Construction Group thanks you for being part of the amazing life Tom led.